Recently I had the pleasure of seeing a young boy at my practice when his mother brought him to me for a second opinion. She was told by another endodontist that her son’s tooth had to be extracted and she wanted to see if there is any way to save his tooth. I felt honored when she told me that her general dentist sent her to me because I have a reputation for being a tooth saver (I’m not going to argue with that). And the funny thing is that after a long conversation with this patient’s mom, we realized that we had graduated from the same high school in upstate New York! What a small world! Two years ago, the patient fell and tooth #9 was completely avulsed and then was reimplanted about 1 hour later, according to his mom. It appeared that treatment on the tooth was started, but was never finished or was starting to fail. It looked to me like a regenerative therapy may have been started, but wasn’t going so well. Or maybe this patient didn’t realize there was more to their treatment and didn’t return for the proper follow up. That can be the trouble with trauma — we lose patients due the excessive appointments needed for proper treatment. I didn’t know the real answer to my questions about the previous treatments, and the patient’s mom was confused as well. But it is what it is at this point, and I just needed to fix it. Upon evaluation, I could see that the patient had some vestibular swelling, he had pain to percussion, there was a grade 2 mobility, there was no response to cold, and probing was all within normal limits. 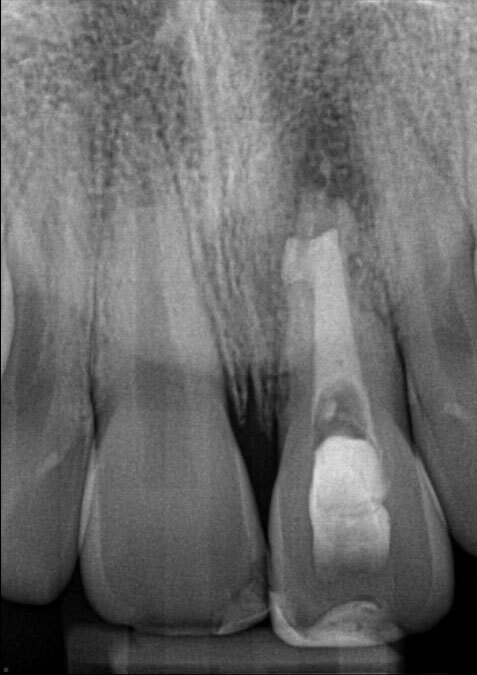 My diagnosis for tooth #9 was Previously Initiated Therapy with Acute Apical Abscess. In the radiograph, you can see that the tooth had been accessed and the tooth has an open apex. 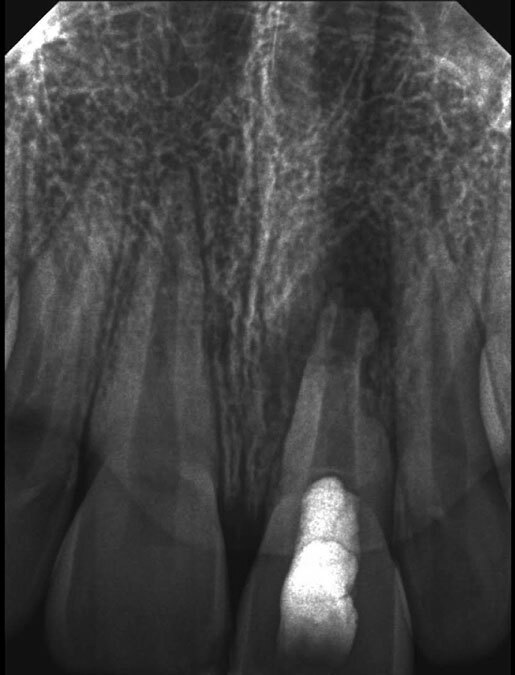 You can also appreciate the inflammatory root resorption that has occurred on the distal aspect of the root. When it comes to children, I say try whatever you can and don’t give up so fast. I think that the conversation you have with the parent is super critical. They need to understand that the tooth is compromised, and even though you are trying your best, they need to be prepared for loss of the tooth. Even if the tooth does not have a good long-term prognosis, I still want to try to save the tooth in place as long as I can. This will buy time to get the child to a point where they are old enough to get an implant. Keeping that bone in function so that there is minimal bone resorption is key so that the patient stays an implant candidate throughout their growth and development. If it has to be a space maintainer, then so be it, but don’t give up!!! In residency, I had a teacher who was incredible when it came to trauma. This man had such an influence on me that trauma is one of my favorite parts of endodontics. If he reads this he will know that I am talking about him, and this case would make him proud. I followed his exact protocol, and keep reading to see what happened! My goal in this case was to halt the inflammatory resorption which was occurring because of the bacterial infection in the canal, and I wanted to re-establish the bone and the periodontal ligament. First, I accessed the tooth and obtained a working length. I was really careful not to instrument the apex too much since the walls were so thin. Instead, I relied on my irrigation to do most of the cleaning. Then I packed a slurry of calcium hydroxide paste. I used Ultracal by Ultradent with a Vista tip. I then let this medicate the tooth for about one month. When the patient returned, the swelling was already gone and the tooth was no longer tender to percussion. At this appointment, I re-irrigated and lightly re-instrumented, and then placed a dense pack of USP calcium hydroxide. I let this sit for 3 months before I brought the patient back. Notice the difference in the radiopacity of the material. This calcium hydroxide is the same radiodensity as dentin so it makes the tooth look completely calcified. 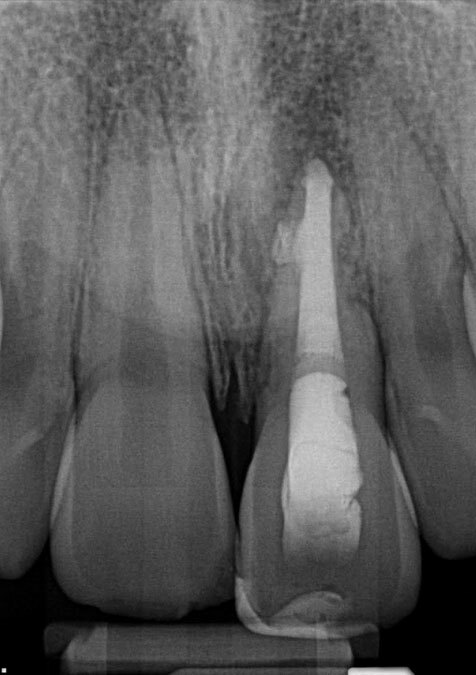 You can also see some small changes in the size of the periapical radiolucency and the positive changes on the lateral aspect of the root. When the patient returned, the tooth was ready to be obturated. Already the periodontal ligament was starting to re-establish itself. Since the apex was wide open, I knew I had to change the way I obturated this case. 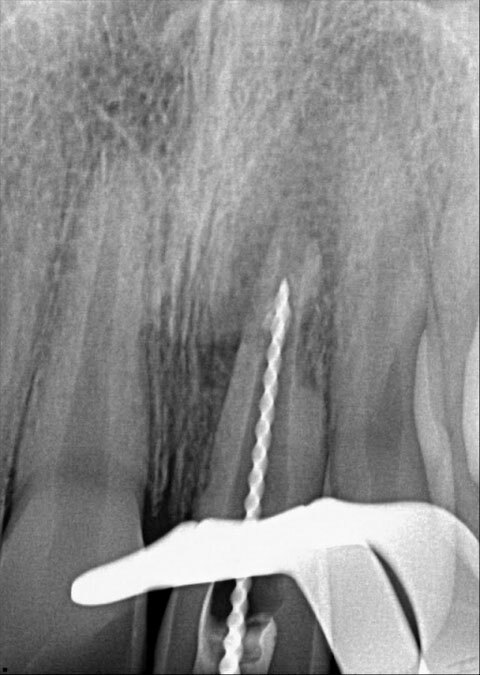 So, I used white MTA to obturate this case in the apical 2/3 of the root. In order for the MTA to set properly, I placed a wet cotton pellet over the MTA for several days. The patient was brought back for the final restoration on another day and the remainder of the tooth was restored with composite. We will continue to monitor his progress and he already had a 3 month recall and you can see some regeneration of tooth structure on the distal aspect of the tooth and the only remnants of pathology is on the mesial aspect of the root, which should continue to resolve over time. 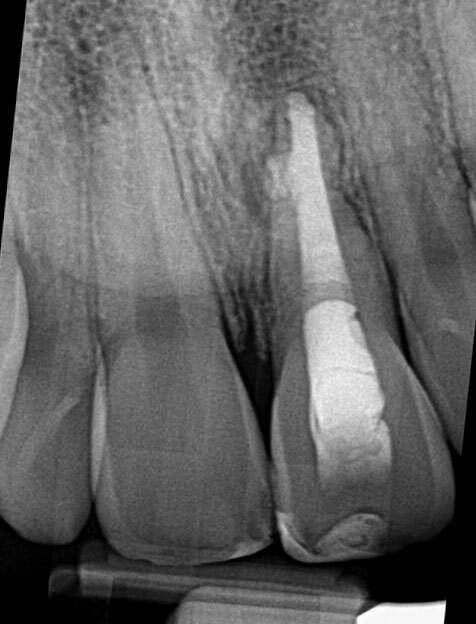 I wonder how many other dentists would agree with the previous endodontist that this tooth was not savable? I think this tooth has a great prognosis and I no longer refer to it as a space maintainer. Imagine if this tooth was extracted — it would have been a complete disservice to this young boy! As dentists we need to consider all the possibilities and the impact it could have on our patients’ lives. This little boy no longer needs to be self conscious or concerned that he is going to lose his front tooth. My treatment of this case is not heroic by any means. This is what I see on a daily basis, regenerating bone, case after case. The power of a root canal is quite remarkable and we need to give teeth a chance before we condemn them. I hope you learn from these cases and understand that sometimes it is worth the try. And this is true not just for kids, but for adults, too. You just never know. Sometimes you just don’t know what is possible until you try. Enroll in the virtual endodontic course that will enhance patient outcomes, build upon your knowledge, and increase your revenue. 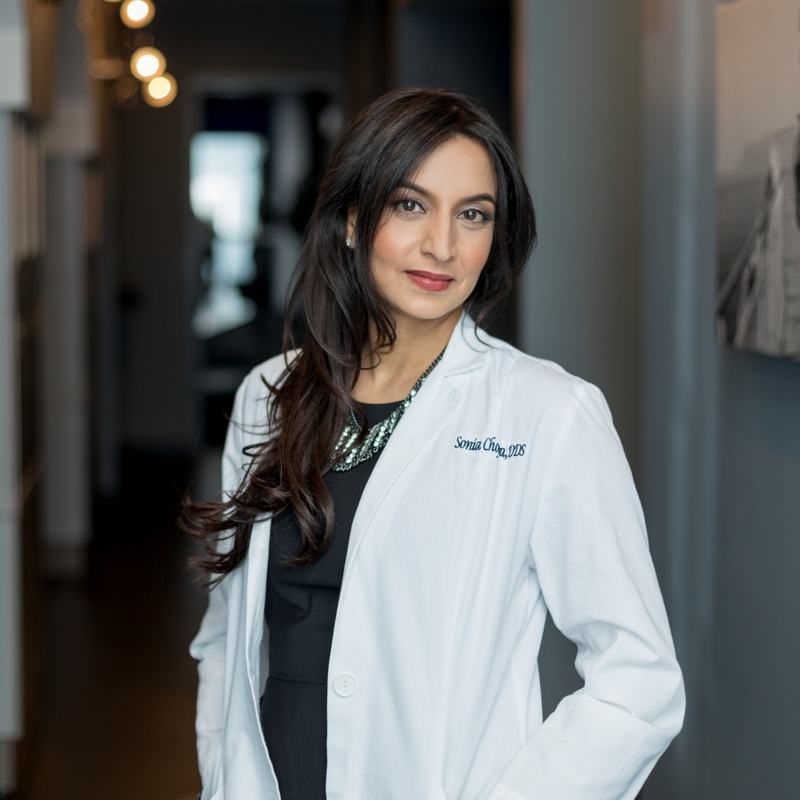 Thank you Dr. Kuldeep – I’m thanful for your feedback, and there are more cases to come! “it is better to try and fail than fail to try” and u proved it right!! I am a periodontist, have few questions..
*What is your opinion on apical resorption taking place in this case? * What was the canal obturated with 2/3rd MTA and 1/3rd with? * How was the mobility pre operative and post RCT? Hi! 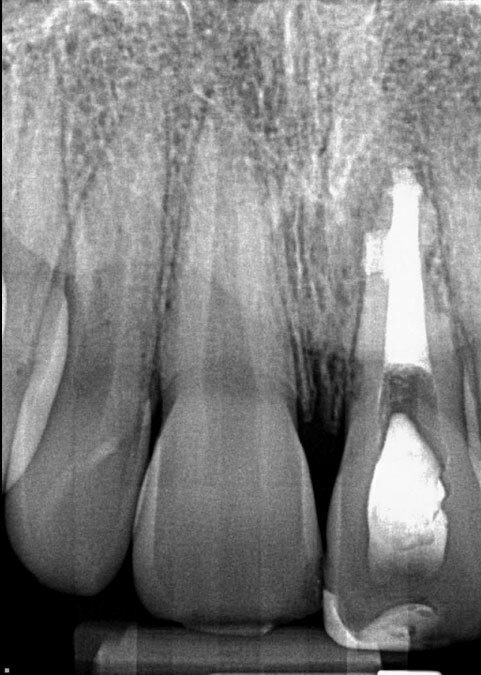 The resorption taking place here is inflammatory resorption since the root canal was not completed. Unfortunately, the parent could not give the best history. She seemed pretty unaware of the prior treatment. At the time of meeting the patient, he was swollen, but the tooth was not that mobile. There is absolutely no mobility now as well. 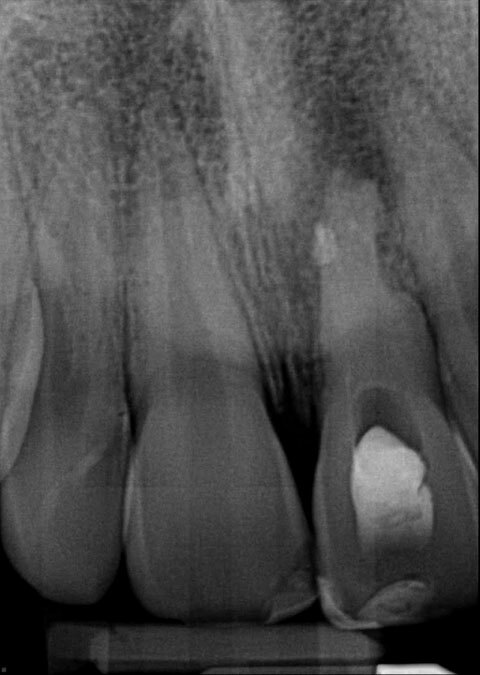 The tooth was obturated with MTA in the apical 2/3 and composite in the remaining coronal 1/3. Great case with great outcome! About 98% of general practitioners would condemn this one at the outset. Many things to consider here….oftentimes parents want an inexpensive “quick fix” and just can’t grasp the need to keep a god-given root in place during growth and development. Thank you Richard – more coming your way! Dear Sonia, what a great Service you did to child and mother both. What if placed MTA initially rather Ca(OH)2? Hi and thank you for your comment. Since the patient was really swollen at the initial appointment, I did not obturate the tooth right away. I wanted to make sure that I saw some healing after the initial disinfection to make sure that the treatment was working. Thanks for your fellow Endo support Judy! amazing job! really learning a lot from your tooth stories! keep it up!! I love your presentations. Dentists are too quick to condemn a tooth and has gotten away from helping patients keep their natural teeth ( a Dr. Pankey philosophy). You not only try to do your best, but serve with compassion. Psychologically this has a great impact on your patients. Right on Steven! Thanks for reading! Hi! Unfortunately, I don’t know the full history of this patient since the parent was not sure of the previous treatment. I thought that perhaps someone may have tried a regenerative therapy on the patient already and it was failing or perhaps the patient got lost in follow-up. Since I was uncertain of the previous care, I went old school and wanted to get him comfortable and reduce the swelling. Once I started to see that it was working, this was my path. But, certainly I think that it is possible to try to do a regenerative therapy here. To answer your question, I would have assumed this tooth was hopeless…I’m glad that was not the case. Great work! Thanks for sharing – this case was fascinating! Endo Lesson: MB2s are Everywhere!